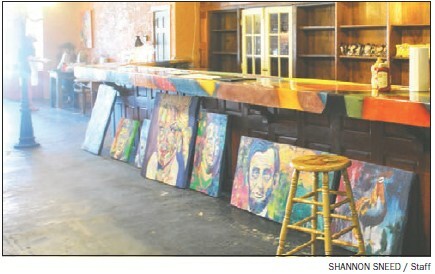 Canvas portraits by Putnam County native artist Janice Irmgard Westfall line the base of the bar at Spicy Southern as owner Krystal Epps decorates the new downtown restaurant. Westfall’s eclectic artwork is on display at the North Jefferson Avenue eatery with an option to purchase. Opening the doors to Spicy Southern, a fiery new restaurant in downtown Eatonton, one could be drawn in by the sweet and spicy aromas coming from the kitchen while one’s eyes might feast on the décor. A lamp post is the first object to catch the eye before moving on to a long, multi-color bar designed in rich earthy hues of red, blue, brown, green and yellow. Blending with the colors of the dining tables and the bar, hung upon the walls is an eclectic array of modern art by artist Janice Irmgard Westfall, showcased on deep, cherry-colored brick. “Spicy Southern is a family affair,” Owner/ Operator Krystal Epps said in a recent interview. Epps’ husband and business partner, Cecil Epps, who is employed at Wilson Bryant Air Conditioning, helps on the weekends and her mother, Lisa Jones Hawk, assists during the week. 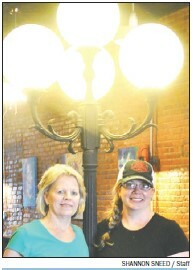 “A family affair,” Lisa Jones Hawk, left, joins daughter and Spicy Southern Owner/Operator Krystal Epps at the lamp post to greet patrons coming in for burgers, hotdogs, pizza and barbecue. “We are telling everyone to ‘#MeetMeAtTheLampPost,’” Epps said. When Epps turned 18 years old, the Putnam County native set out to college and obtained a degree in restaurant management in 2003 from Johnson and Wales University. Epps said she is comfortable in the service industry with a work history which includes a variety of experience ranging from chain restaurants such as Chili’s to high-end dining like Reynolds Plantation. While in Charleston, she obtained experience working at Whitmore Mansion and Middleton Place. Traveling around the U.S. after graduation, Epps spent a summer working at a pizzeria in the Glacier National Park in Montana; as well as restaurants in St. Louis and California’s South Coast region, San Diego County’s Oceanside, before moving back to Georgia. After starting a family, the mother of three, Laci Epps, 11, Lilly Misa, 10 and Dylan Epps, 5, took a break from the restaurant business, but her passion for the industry drew her back in. Trying to balance a full time career and small children can be a challenge; so Epps said she thought what better way to be able to spend the time she wanted with her children than by going into business for herself? That’s when she brought her education and experience together to form Spicy Southern. Epps’ motto is “Why cook when you don’t have to,” she said. The seasoned cook and restaurant manager initially planned on just catering and delivery, “sort of like a meals-on-wheels type service,” she said. After calculating the amount of manpower it would take to do strictly catering and delivery, Epps determined it would be more beneficial to open up a facility offering a dine-in experience as well catering. Some of the items offered on the menu include a cup of soup-of-the-day or pubstyle chili for less than five dollars; burgers, hotdogs and barbeque sandwiches; and barbeque chicken pizza and buffalo chicken pizza. Located at 117 North Jefferson Avenue, Spicy Southern’s hours are currently 11:30 a.m. – 6:30 p.m. Wednesday – Saturday, and 11:30 a.m. – 2:30 p.m. on Sunday. Epps also is considering opening on Mondays and will be offering Wi-Fi capabilities to customers as well as a television for entertainment. 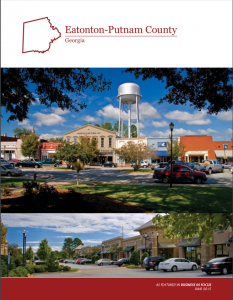 For information, call 706- 816-2322.